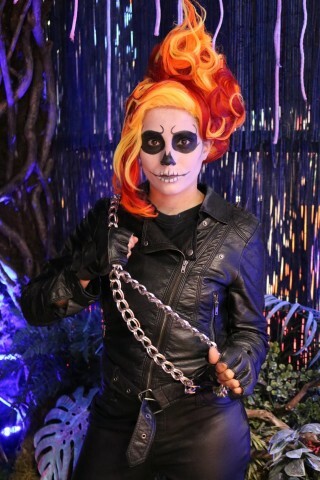 Ghost Rider Cosplay with the Best Wig « Adafruit Industries – Makers, hackers, artists, designers and engineers! Nubia Mejia dressed as Ghost Rider for New York Comic Con this year, and the idea came from her big brother Daniel. She figured the hardest part of the costume would be re-creating the flames. She didn’t want to use plastic or foam because she didn’t think they’d look right, but luckily for her, her sister-in-law Kaori has mad styling skills. 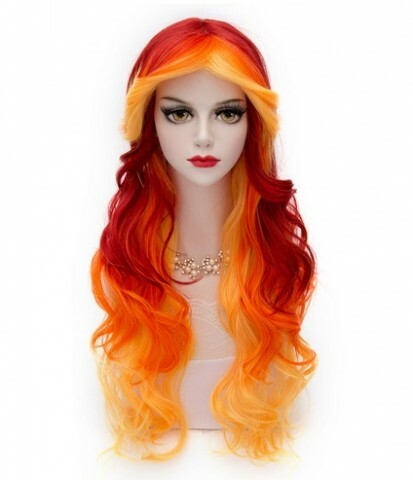 Nubia acquired a synthetic wig with appropriate flame colors – yellow, orange, and red (it’s pictured below). Then, Kaori used molding and layering to create the masterpiece. 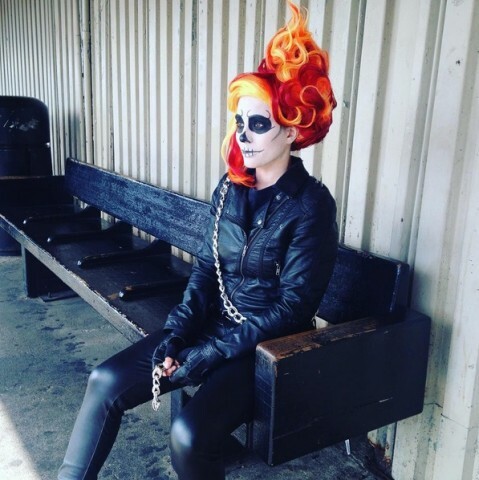 She did an amazing job making the wig look like flames; it’s definitely the most striking part of the costume and the coolest Ghost Rider wig I’ve seen. For the outfit I started out checking what I had in my own home (This should be your first step for any cosplay, you’d be surprised). I was about to throw out this faux leather jacket I purchased at H&M a few years back because it was peeling. I’m so happy I didn’t because it was perfect for my Ghost Rider cosplay. I also figured the peeling could look like pieces of the jacket were burned through so I didn’t worry about that. I went to a few trim stores in Manhattan and picked up a handful of spikes to add on the shoulders of the jacket. I also found the chain at a trim store because I decided to not use aluminum or plastic. The chain ran me about $20. I already had a pair of Dr Marten boots because well… every fashionista does. I was hunting for a pair of faux leather pants but I couldn’t find them anywhere surprisingly. I walked into Walmart and found a pair of leather leggings that looked like pants for about $12. I purchased medium instead of small because I didn’t want them to look skin tight… I wanted them to look masculine and have a bit more of edge to them. Lastly, the gloves I found at a random little gift shop for 5 dollars. Read more at Nubia’s blog.